Please note that above price is subjected to change and is for reference purpose only. Kindly contact Honda Nepal to get the latest showroom price. Note: Honda car price list was last updated on February 22, 2019. Honda cars in Nepal are distributed by Syakar Trading Company Private Limited. Established in 1976, it was formerly known as Syakar Company Limited. It is part of Jyoti Group which owns more than 15 companies from trading, manufacturing and service industry. It is the sole authorized dealer of not just Honda cars but also of Honda motorcycles, scooters and power products. Since 2011, it became full subsidiary of Honda. Company started importing and selling four-wheeler automobile since 2002 A.D. through its first showroom at Dhobighat. As of now, Honda has 9 showrooms all over Nepal for car to cater the need of customers. Talking about Honda as global brand, it is a Japanese conglomerate multinational company founded by Soichiro Honda. He was mechanic at Art Shokai garage and had keen interest in automobiles. There he fine tuned cars and entered them in races. Eventually, his passion led him to found an automobile company which is now a leading automaker in the world. It is the largest manufacturer of motorbikes, and is among top 10 largest automobile manufacturers in the world. It was the first Japanese brand to launch dedicated luxury brand called Acura. Honda’s global lineup of cars & automobiles includes Accord, Civic, CR-V, CR-Z, Fit, Insight, Legend and Odyssey. 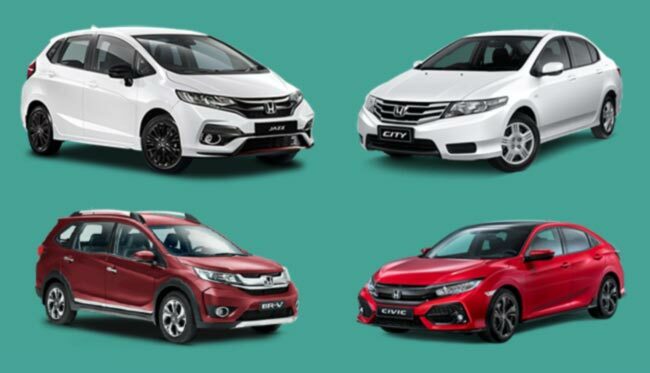 In Nepal, Honda is selling 10 models of cars and their variants in categories such as sedan, hatchback and SUV. These car models include Honda Amaze, Honda Brio, Honda BRV, Honda City, Honda Civic, Honda CRV, Honda Jazz, Honda Mobilio, Honda HRV and Honda WRV. As metioned above, the price of these Honda cars in Nepal starts from around 29 Lakhs which goes upto Rs. 1.33 crore for high end cars. Also, you can message us your queries regarding Honda car price in Nepal or its specifications at our Facebook page.